This class is for children ages 4-7 years of age. We meet twice weekly for 30 minutes. It is a very basic program where young students become aware of their body parts, their joints and how they move. We also do basic karate skills such as punching, blocking and kicking. We work on simple stances, and do very little partner work. We also concentrate on listening skills, and respect and good manners in and out of the dojo. 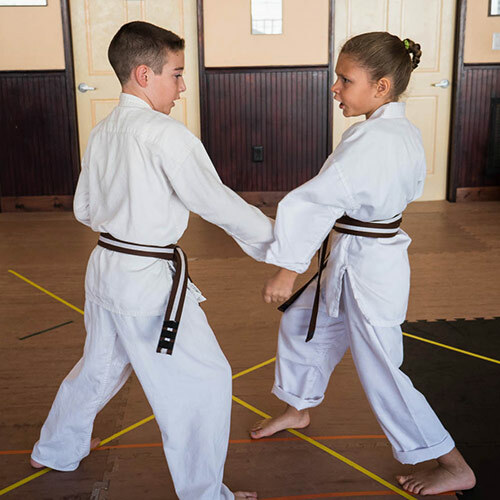 Once they master these basic skills, and one simple kata, they advance to the regular children's white belt class. Parents are encouraged, but not required to stay and watch the classes. These classes are for students age 7-13. They are 45 minute classes, and we offer up to 4 classes weekly, as well as a practice session on Saturdays. We are NOT a "karate-based day care"; we teach real techniques for real life based on kata (forms), bunkai (analysis of the forms, performed with two people) and kiso kumite (fighting drills and counter attacks, also performed with two people) practiced in a safe environment. We do not water down the training, but there are fewer requirements for black belt (junior grade) at this level. All students progress at their own pace, we do not test on a set schedule. It can take anywhere from 3 years to several years to achieve the rank of junior black belt. Our children's classes are fun, challenging, and the skills and discipline the students learn help them in other areas of their lives. We teach a special kata called "Sanchin" which is meant to develop concentration skills so that students are not distracted by outside factors. This can help in school, and other situations where focus is required. Parents are encouraged, but not required to stay and watch the classes.